A simple recipe that packs a lot of flavors! These pancakes make for a wonderful and healthy breakfast option for any day of the week. Melt a pat of butter and spread over bottom of pan. Meanwhile, whip egg whites with a fork until light and frothy. Mash one banana with a fork until smooth. Fold mashed banana into egg whites. Pour batter into pan and allow to brown on the bottom. Carefully flip pancakes and brown second side. Crush pistachios using bottom of large glass or flat side of large knife. 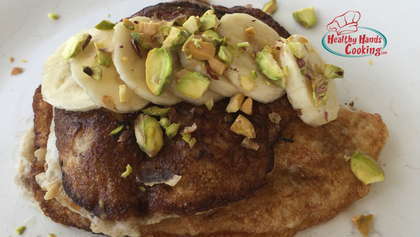 Remove pancakes from pan, place on plate, and top with 1/2 sliced banana and crushed pistachios.